Team InvestSF knows luxury and sustainable design. 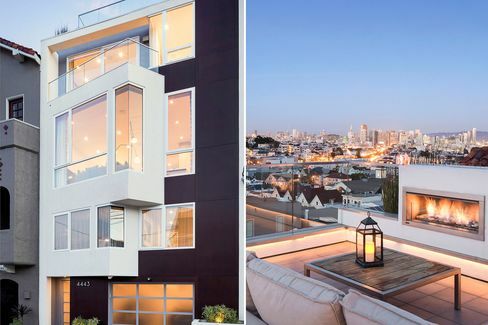 Call us now to see the most luxurious eco-friendly properties in San Francisco. In the pre-crash days, sustainable building materials and low-flow toilets became part of the common real estate conversation: Slap “eco” on a home, the thinking went, and it was more valuable, not just to the earth but to the homeowner. The most direct path to an officially green building was through third-party certification—if the building could check enough boxes on a list, it was green. LEED, which stands for Leadership in Energy and Environmental Design, is the most prevalent. The checklist includes boxes for everything from air purifiers to locally sourced lumber to low-emission paint. You’d think that in this era, when the top tier of the luxury market is starting to wobble—and LEED has been lampooned for putting bicycle storage on par with geothermal heating—that third-party certification wouldn’t hold much water. But green still commands a higher price—at least, if the builder or homeowner gets the formula right. The team at Realtor.com combed through their inventory of active single-family homes over $750,000 and found that individual eco-friendly features such as low-voltage lighting or solar panels result in only a slight uptick in price. Homes with Energy Star appliances command a median 8 percent premium over similar homes that lack them. So do smart thermostats. (Premium calculated the percentage difference as the difference between the median price per square foot of homes with an eco feature and that of all other homes in the same zip code.) Solar panels can knock the price up 12 percent. Bamboo floors and dual pane windows, however, don’t seem to affect the price at all. But homes with the whole eco kit and caboodle can cost much more. The median premium for LEED homes is a whopping 50 percent. It turns out you’ll need a lot more green to get a green home. “Affluent buyers do not want eco at the expense of luxury, but if you can put them together, they’ll pay a premium,” said Gregg Lynn, Realtor with Sotheby’s International Realty, who has sold several luxury green homes in San Francisco. The homes he sells are like Teslas: His clients buy them as much for design as for their environmental attributes, he said. They wouldn’t buy a Prius or the real estate equivalent of one. Neither should you. 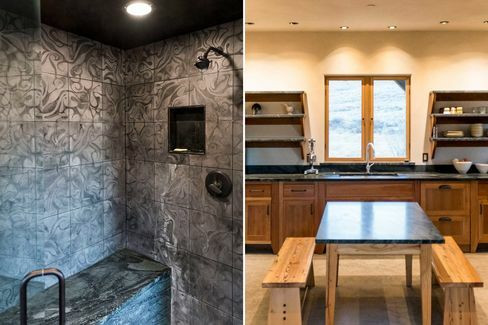 Here are seven super-green homes across the U.S. that are asking a pretty penny, too. 4443 19th Street is a LEED Platinum townhome in San Francisco’s Castro District. This custom LEED Platinum townhome in San Francisco’s Castro District was designed and built for a tech company exec, so it makes sense that it would include green widgets. The most dramatic of these is a wall made of industrial polycarbonate panels that bump up energy efficiency: They both filter heat and let natural light through. This home has no electric bills. It generates all the electricity it needs though photovoltaic panels. 1021 McCormick Ranch Rd. — Crested Butte, Colo.
1021 McCormick Ranch Rd. 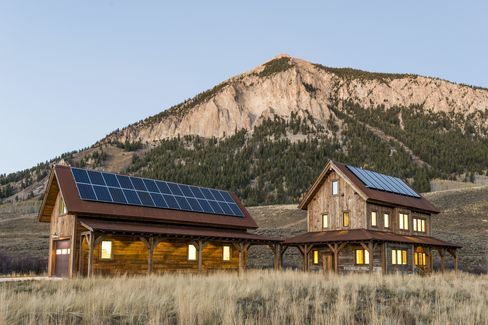 in Crested Butte, Colo.
You can build your own eco-haven on McCormick Ranch’s seven 35-acre lots. But for a turnkey option, there’s already one finished property that includes a guesthouse and barn, with a finished space above the garage. That adds up to two bedrooms, three bathrooms, and 2,221 square feet of living space. 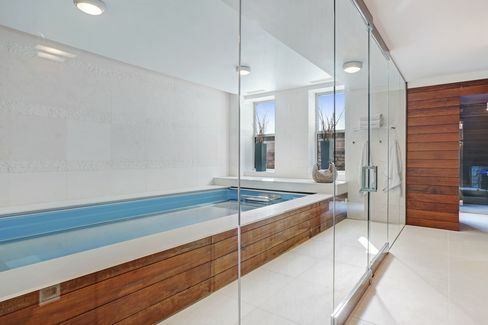 Bathroom and kitchen in the $3.3 million LEED Gold-certified ranch home. Ocean-to-Lake Estate — Manalapan, Fla. 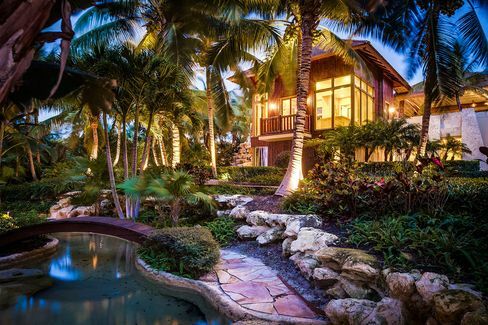 The landscaping and water features are as lush as the Palm Beach County location. How eco-friendly is a 12,305-square-foot, single-family home? Luckily, LEED doesn’t ask how many people are living in one enormous space. 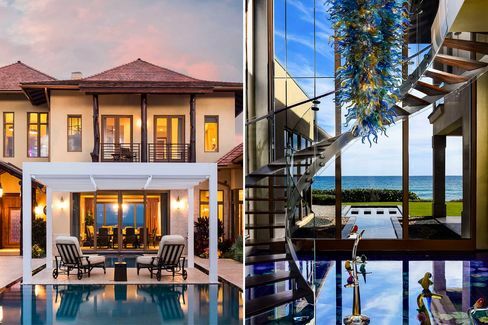 This one, inspired by Tahitian architecture, has seven bedrooms and 11 bathrooms. Both the Florida Green Building Council and the Energy Star for Homes programs have certified this place as green, too, thanks to its rainwater collection system, air purification systems, and solar panels and energy-efficient appliances; on some days it is energy-neutral, meaning it doesn’t use any more electricity than it generates. Here, $26.5 million gets you a pool (left) and a living aquarium underneath glass floors (right). 1724 Colfax Ave. South in Minneapolis is LEED Silver certified. There aren’t too many newly (or new-ish-ly) built homes in the Lowry Hill section of Minneapolis, but this four-bed, six-bath, 6,483-square-foot, Victorian-style home from 2008 fits the surrounding architecture and has a few green features up its sleeve. The great bulk of its building materials were locally sourced, it has radiant-heat flooring, and a lot of low-VOC and organic products from paint to lumber. 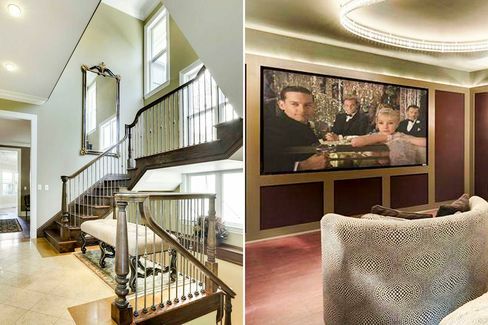 Staircase and screening room in this 6,492-sq-ft Lowry Hill Victorian. 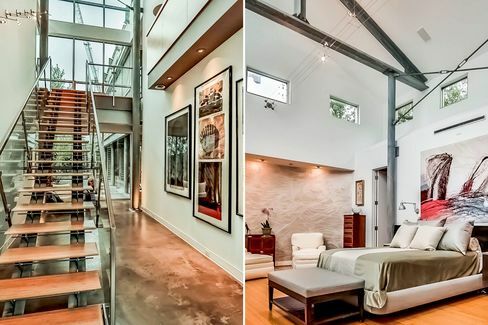 Houston’s first LEED Platinum home is on the market for $2.695 million. Texas, not known for much of an environmental movement, is home to some pretty good-looking green architecture. 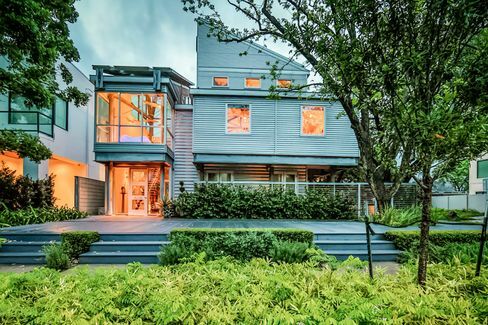 Take the first LEED Platinum home in Houston, which has graced the pages of design magazines. Its green features include bamboo floors, solar power—including solar-powered AC—and low-voltage lighting. Staircase and master bedroom at 3319 Virginia St. in Houston. 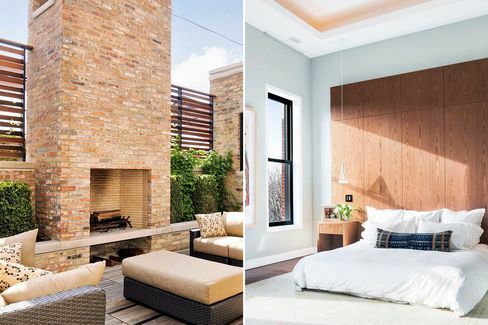 Deck and master bedroom in the six-bed, nine-bath, 7,400-sq.-ft. Chicago townhouse, retrofit to LEED Platinum status. While some think it’s always greener to reuse than start a project anew, it can be hard to retrofit an existing home to LEED Platinum; there are just too many boxes to check. 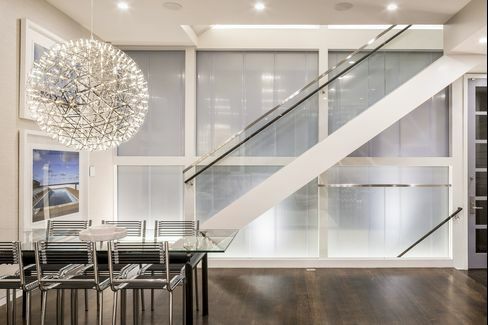 Yet somehow, the owners of this six-bed, nine-bath, 7,400-sq.-ft. Chicago townhouse were able to reinvent it. The solar power-heated Indoor pool at 2015 N. Cleveland Ave. in Chicago. 2 Pauls Lane — Water Mill, N.Y.
2 Pauls Lane in Watermill, N.Y. Plenty of green architecture these days is contemporary, angular, and ready for the glossy pages of design magazines. 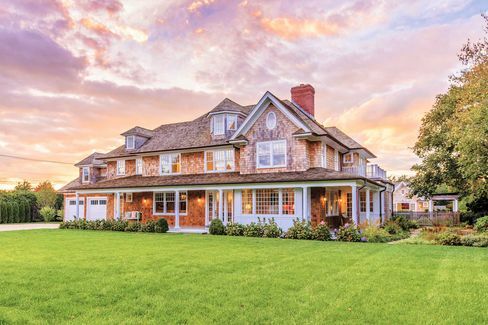 But this traditional Hamptons-style shingle home near Easthampton, N.Y., looks as if it has graced the lot for decades. 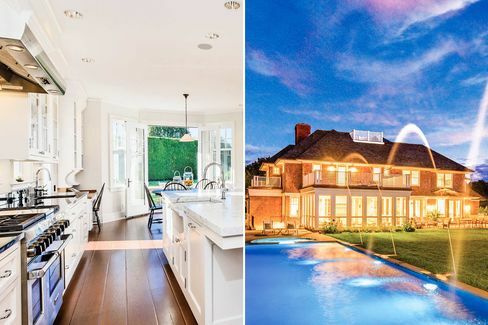 Kitchen and pool in the 9,000-sq.-ft., $7.85 million home.